In the forward to this book, Dr. Kalim Siddiqui described it as his 'last testament'. Few realised the significance of this statement at the time. Fewer still imagined that he would leave this world so soon after its publication. The book came off the press two weeks before he died in Pretoria, South Africa, on April 18, 1996, after attending the highly -- successful International Conference on 'Creating a New Civilisation of Islam'. It was an instant success. The first print ran out in two days! Despite its title, this book is not about the Islamic Revolution in Iran. It is about the new phenomenon call the Islamic Revolution. 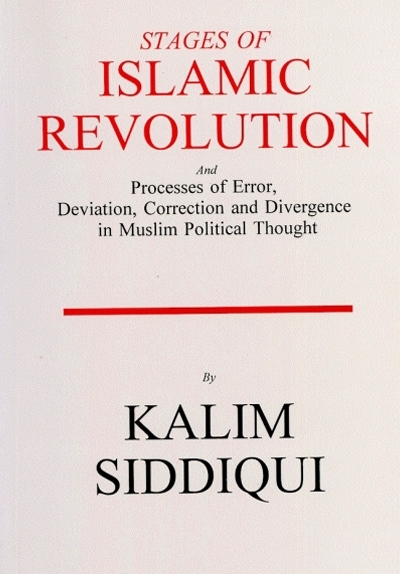 Dr. Siddiqui insisted that, like a scientific process, the Islamic Revolution must be repeatable. He believed that many new Islamic Revolutions are already in the making. They are, as he put it, part of the regenerative power of Islam. In Stages of Islamic Revolution, he rises about events in Iran and treats the Islamic Revolution as an inseparable part of the evolutionary processes that are at work in Muslim societies. He considers much of Shi'i and Sunni theology to be deviant and divisive, and insists that the Ummah is united in the pursuit of a common destiny through successive Islamic Revolutions. He sketches this new destiny through all its stages, beginning with 'intellectual revolution'. He identifies the ideas that are already part of such a revolution. This book is indispensable reading for activists of the Islamic movement, as well as for those who want to understand processes and events in the world of Islam.